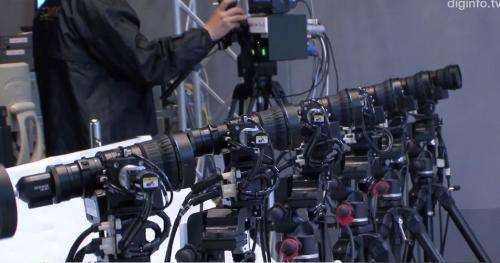 (Phys.org) —NHK, Japan's national broadcasting organization has developed a multi-camera system that allows for recording a single scene from slightly different angles. A computer knits the recorded video together allowing for a special effect known as "bullet-time." The term has come to be defined as a specific type of special effect where time appears to be slowed to the point of being able to follow a bullet after being fired as it makes its way to a target. Additionally, the point of view is altered while the bullet is still moving, simulating an ability to circle around it. In the new system unveiled by NHK, eight cameras are mounted next to one another on tripods. Each of the cameras has two motors—one to control tilt, the other panning. The motors are controlled by a computer system that automatically allows for causing all of the cameras to point and focus on the same subject at the same time. Because of the small distance between the cameras, each has a slightly different perspective. After the cameras record an event, the video from all eight is fed into a computer that knits the sequences together creating a seamless video of the subject appearing slightly pivoted. The system takes just one minute to combine the separate video threads into a new single one ready for display—opening the door for use in live events such as basketball games or news broadcasts. The system is an improvement on the process used to create bullet-time in the movies—there a single camera is placed on a track and moved to allow for perspective change, generally in front of a green screen. Afterwards a lot of time is invested by many people in creating the final effect. In contrast, this new system uses fixed cameras while a computer does all the work. To use it, a single cameraman manipulates a control device via display panel to follow the action—the cameras all mimic its movements. The result is a camera system able to create video that appears to circle around a basketball player going for a layup, for example or a speaker standing at a podium. The system is not live of course, thus it appears its best use would come in capturing small segments of video events that are likely to be important, such as a touchdown in football. Because live action ceases when such events occur, programmers can display the event over and over as they do now with instant replays, offering viewers a new perspective.